As it happens, I was involved in stage tech myself at the time, so as we were waiting for the concert to start, I was surveying the details of their tech set-up. I noted that the follow spots were positioned above and behind the band, so they could reflect off the mirrors right over me, and bounce on to the musicians from the front. I was scanning the rigging overhead, and as I was looking up, I saw the lighting technician begin to adjust the mirror. I distinctly remember saying to myself; "Hey, that thing's not safety-chained! "...and a moment later, it let loose. I saw it coming all the way down, floating almost in slow motion and screamed "look out! "....but I don't think anyone heard me. Wow, here it is. The one lost Yes show history ever needs. Whoever pinned down that original master is owed many psychedelic flashback thank yous from my faded memories and long gone worn out cassette tape from one of the last times WMMR Philly ever replayed it. Strange it feels a touch choked up as the notes and life and my date and friends from back then return. High School graduation was a few days earlier. Those of us from Wayne Valley High School in north Jersey who had our parent permission to go, pinned this date on our calendar at least as much as the graduation ceremony. and Mr. Shaun Toole whoever you are master recording remixer, wow you brought it all out as no radio replay rerecording was able to. My neighbors have never heard atmospheric penetration of my stereo like this... I sorta forgot too, what I devoted my whole summer savings one year in college buying, a spontaneous Saturday afternoon for mental health spontaneity, of couse enhanced by a Macbook Pro's enhanced HDMI audio feed. still... nous somme du soleil. 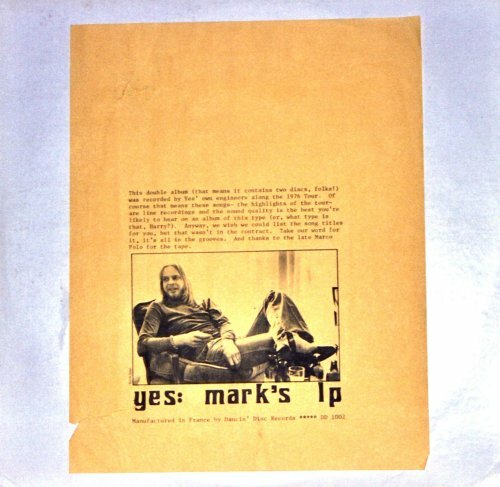 Later tonight I'll get back to work, do the wash, send this stream link out to old friends, return to daily Silicon Valley startupper's life, where I regularly encounter where many old Yes freaks ended up focusing our expansive creative minds when it came time to launch a career. inspired me to get the New Jersey license plate "RELAYR" for my cars before leaving the state, orchestration and musicianship beyond any other YesShow of the dozens I saw and that ever made it onto an album, would I start singing, Soon..., of course how could I not, the raised key into Jon's second time through the chorus, I expect emotions in listening to this as I haven't in, since that old concert tape jammed and left me stranded for two decades without a way to relive that magical time that, as many other commenters here have stated, was a life defining moment. For several years I regarded this as the Best Day of My Life. I was 16. It had been a great spring for prog. 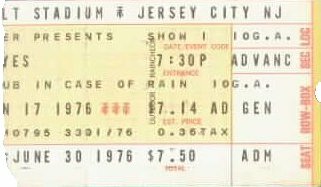 In April, Genesis (with Bruford) was at the Beacon for three shows, and in May, Nektar played the Beacon and the Capitol in Passaic. Both bands put on great shows, including lasers and other effects. 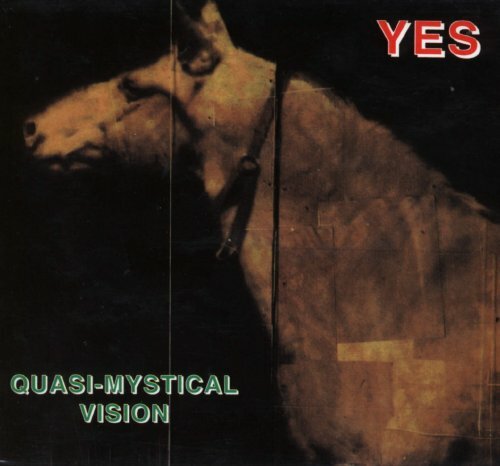 I was stoked for more of the same from Yes, my favorite band. There was a long wait for darkness, but finally Yes came on. The musical performance and stage production were tremendous, and I can't add much to the other descriptions here, the recording, and the photos from the tour. (You can use a search engine to find more photos not on this site.) This was the first concert I saw with video screens, but they were in black and white, so I mostly watched the stage. The second encore of "I'm Down" is an interesting novelty now, but at the time I was disappointed because I was hoping for more Yes material. The radio DJ talked about lasers hitting buildings in Manhattan, but I'm skeptical about that, because the stage was facing roughly west, away from NY. It seems more likely they would have been hitting buildings in downtown Newark, about 3-4 miles to the west. The Grateful Dead are mentioned a few times here, and on this night they were playing only about ten miles away, in Passaic. After that spring's set of shows, I was head over heels in love with prog and good concerts. 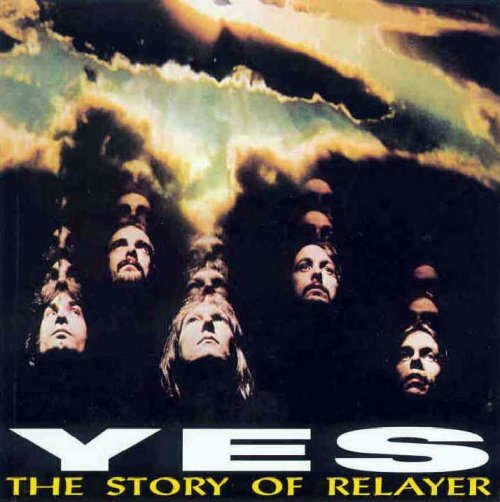 The place of Yes as my favorite band was cemented for years to come. And, even now, in many years I still mark this date by playing recordings from the tour, looking at pictures, and remembering. Wow blast from the past. This was the first of what was to be two dozen(at least) YES concerts I saw. I was so blown away at this show. I lived in Hackensack a group of us took a "City Bus" smoking doobs the whole trip...the whole bus was smoking and the driver never said a word. I remember the Laser/Light show and was instantly hooked. I think two years later they played at Madison Square Garden and we had tickets for evey show (college roomate and I) Oh music to die for. I've seen them in at least a dozen venues. When I broke my foot Roger Deans artwork covered the cast. All my college note books had the infamous YES doodles. Last I saw them was about 4 years ago at RedRocks Amphitheater here in Colorado. Jon was winded and Rick Wakeman looked like he was struggling. Still the show was outstanding with a lot less doobies. I so fondly remember 10 years of nothing but YES and the anticipation of every album or tape. Thanks for the site! So glad I found it! hey johnny....this is a very popular show in the YES trading circles. try posting on allgoodpeople.net or yesfans.com and looking up in the trading rooms this show.....search roosevelt stadium and it will come up. i'm sure you can get a copy from one of the traders. I was living in Basking Ridge New Jersey and Playing Keyboards with other musicians.I had friends making LSD whom I was tripping with that invited me.By the time we arrived at the stadium I was tripping pretty heavily. 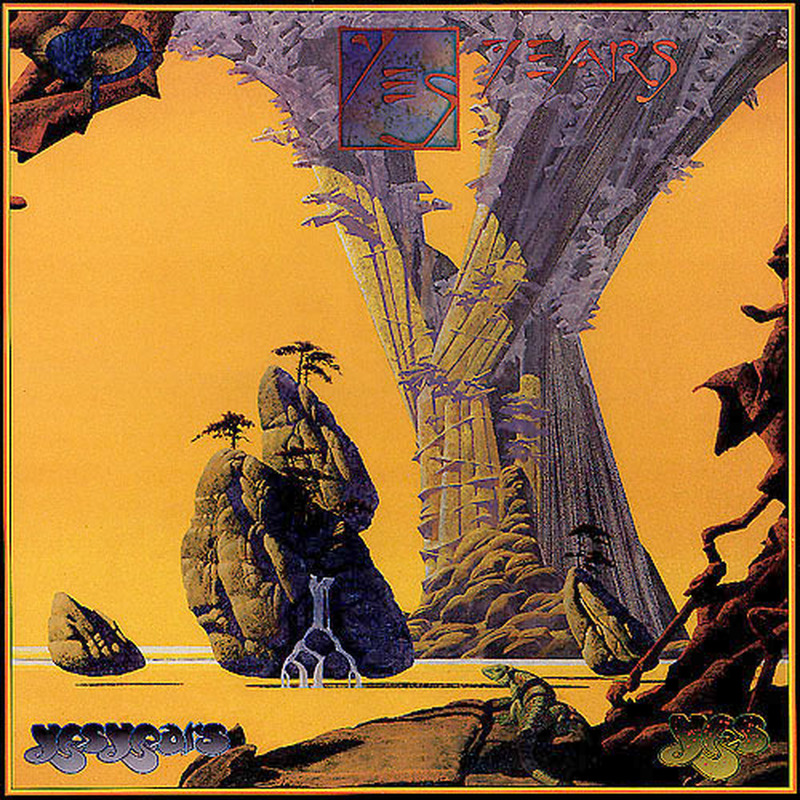 I remember my friends trying to convince me that Yes's music was not average rock and roll and I wouldn't be bored. We were sitting right next to the sound crew who had a raised stand up about 10 feet.My friend asked him how loud the Pa was and he said fifty thousand watts per channel. "Maggie May" was playing and he turned it up to ear piercing volume. The Pa was so powerful that you had to practically hold on so as not to get blown over.I remember the warm up band sounded like corny country music and someone was complaining that they looked goofy bobbin their heads with cowboy hats on.Someone hit one of them I think with a frizbee. 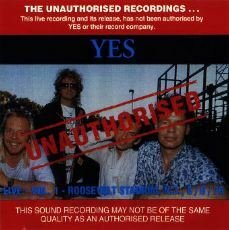 When Yes came on and played I remember that Steve Howe playing a series of blinding leads.Cris Squire was blazing a trail of Bass lines too and Patrick Moraz playing synth solo's I never thought were possible and he was very animated too. He danced all around the keys as he played them. Allen White had this big smile and played blistering drum fill -in's. The Laser lights were the most spectacular I have ever seen at least they seemed to be because I was tripping.They were on some robatic apparattus that hade the lights move in all directions. That show changed the way I played the keyboards and who I felt about music in general because the quality of the music the chord changes, the guitar,bass and keyboard licks were of such a high claiber that no band can even come close to reproducing. I have been to many Yes Shows since then ANd always remember that show as the night that changed my life. SINCE WNEW IA NOW DEFUNCT,AND THE ARCHIVES ARE IN COFFINS SOMEWHERE IN N.Y.C,IS THERE A WAY TO GET A HOLD OF THE COMPLETE CONCERT ANYMORE?? UNFORTUNATLY I WAS NOT BORN YET AND MY DAD WAS AT WORK IN KEARNY LISTENING.I REALLY WOULD LIKE TO HEAR SOME OF IT!!! My only regret in life is missing this show. I lived in Brooklyn at the time and had a regents exam the next day (MATH I think). How did you get permission to go?? Damn It! Well I'm sure you had a fantastic time....I spent the night listening to Alison Steele "the nightbird" on WNEW. The Live Broadcast. At least I heard the show. This was my first concert and it was a great initiation. The laser show and the music were excellent and the whole outdoor show experience was great. I drove there from Queens NY with 3 friends and we got home at like 2:30 in the morning. I was in my junior year of high school and had an English regents exam the next day at 8:30 am. When I got home I was still wired from the show and my head was buzzing. I laid in bed for like 4 hours without sleeping. I don't know how but I got a 95 on that regents exam. When I walked into the test at school that day people were like "Man, what the hell happened to you ?". It was a great experience for a first concert ! We found a spot centre stage, muddy blankets covered the ground. The concert was FANTASTIC !!! THOSE WERE THE DAYS OF GREAT OUTDOOR SHOWS.. I was 18 years old when I saw this concert. Great memories of this one, except for the riot I got caught in out in the parking lot after the show. My windshield on my '68 Firebird was smashed by some luny who threw a beer bottle. Neverless the music and laser show was fantastic. This was my third concert at Roosevelt Stadium where it seemed at the time all the great acts were appearing. I had went to the 1975 Yes show at Roosevelt Stadium also, but unfortunately I can not remember too much of that one due to the fact that I drank too much. The stadium was demolished in 1985 and is now condominiums. For the guy who thinks it is still standing your thinking of the Roosevelt Stadium in Union City(It was also slated for demolition last year). And I remember another thing. The crowd was getting sick of the Pousette Dart Band, and over my head I saw a bottle fly and it hit the acoustic guitar of one of the band members. They ended the set shortly after that. WOW, it was a great show. I was 16. 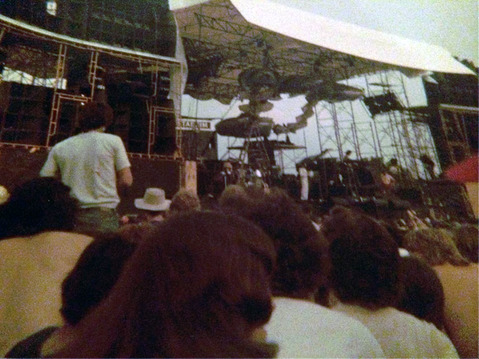 I remember sitting next to a friend, in the late afternoon, close up near the stage; everyone was standing around us as Jon was throwing out fruit. We sat there and a pineapple just landed right in my lap. It was delicious b/c it was really hot outside and the fruit was juicy. The music was splendid and awe-inspiring, and the light show for then was cutting edge and exciting. I remember finding out the next day that a kid had been stabbed and died, but I didn't see any violence. Indeed, it was like a Greatful Dead crowd, stoned, tripping, and friendly. I remember there were LOTS of fireworks being thrown from the upper stands into the field that day. Big stuff - M80's and cherry bombs. It was a hot day, maybe not 100, but up in the 90's. I remember people crowding on the bus to Jersey City after the show. If you walked 2 bus stops south, you could beat the crowd. I really miss the days of the great light shows and customized staging. the lights and staging were as much a part of the show as the music. I remember sitting on the field hours before the show started and a huge food fight started. People started throwing food all over the place. Really got intense for a while. My fiancee and I had to duck down for fear of getting hit in the head with who knows what. Anyone remember this? Two people have mentioned that Roosevelt Stadium has been torn down, but I don't think this is true. I have driven by it recently and it is still standing. At least the outside wall is still there - I am not sure what is inside. Steve Sullivan Were you from Union???? If so we went together with Ron Garcia and friends. This had to be one of the greatest shows I saw. Yes, from Roosevelt Stadium in Jersey City. About 35,000 on their feet. Applauding what has been an incredible concert by Yes. They have erected huge television screens on both sides of the stage and I'll try to give you a picture of what's going on here. It's basically an old baseball stadium. You've got the grandstands in the back and bleachers in left field and down the right field lines. With big light (stantions?) on either side. Old fashioned scoreboard in the back as well. And right now we are in what would be center field where the stage is. Slightly behind the stage and we're looking out over the crowd. And you've seen matches lit at Madison Square Garden for an encore, you should see it here. It's just incredible. One of the incredible things, a friend of mine was in the press box, watching, and that's over home plate, looking out into center field where the stage is and the amazing thing was they were using lasers during most of their numbers. Multi-colored lasers. And they were shooting them at the sky and some of them you could actually see off the clouds. But they were going over the Hudson River and actually hitting buildings in Manhattan, you could actually see green specks on the buildings in Manhattan from the lasers being beamed across from here in Jersey City. -- as noted in the early posts, no one was killed inside the stadium. if you look for them). The stadium was torn down in 1986.
day and I recall it being twilight as the show began. quality as the show progressed. It rained most of that day, so the road crew delayed setting up the stage until it was decided that the show would go on. There were two wonderful bonuses for the awaiting crowd as a result. The early arrivers got to witness the complete assembly of the stage, from a bare wooden platform to a massive multimedia extravaganza in the course of a few hours. This was worth the price of admission, to see what was probably the most complex stage setup ever be put together piece by piece. The second bonus was that we got to see a solo sound check for each member, except for Steve Howe who didn't join in the festivities. Each guy came out and played a little. Jon Anderson even played a mini set of songs and greeted the crowd with some stories about his solo music. It was very nice to see them be so informal just before a show that would display them and their music in such a grand form. We were getting crushed in front of the stage,myself and Dave and Janet ,my teenage amigoes,when Alison Steele,The Nightbird ,from WNEW came out and said "Cool out,Yes will be on in five minutes. "She was beautiful.We had seen the mirror fall down and the sound of it hittng some people right on the head was sickening.The injured were handed over the chain link fence to safety.We yelled at Mike Tait because we knew his picture from the Yessongs album. The music was great ,and we kept giving Squire the peace sign and freaked out when he returned it.I'm Down was a treat! !Lasers and smoke all over the place.My Dad grew up in Jersey City and saw Babe Ruth at Roosevelt Stadium.He saw the best and so did I!!! !Greatest concert ever!!! 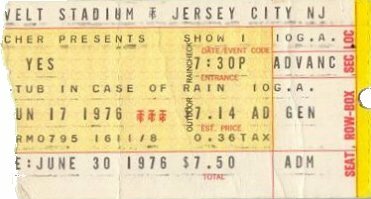 I first saw Yes on the 1976 Tour at Roosevelt Stadium in Jersey City, NJ. It was 100� that day. I took a bus over from the NYC Port Authority with my friend John Weiler. We were just finished with freshman year of high school. A car accident kept us trapped in the Lincoln Tunnel so long that people started to faint on the bus from the heat and bad air. When we finally got to the stadium, there was about a battalion of police off to one side and the noise of much breaking glass. The line of fans was about 10 abreast and went around the stadium. The police had bullhorns and were telling people "no glass inside the stadium" and people were draining bottles of hard liquor on the spot and then breaking the bottles against the wall. Right in front of the cops, this guy wanders up the line yelling "Acid, acid!" I was just a kid, somewhat scared and feeling like I was on the adventure of a lifetime. When we got inside, in addition to the great set that you recall so well, there was a hot air balloon tethered over the stage, with the cover FROM TALES FROM TOPOGRAPHIC OCEANS on it! The opening was the Poussette Dart band ("When you hit me on the head with your beer bottle, something in my chemistry changed . . . "). Between the opening and Yes, there were fireworks. One of the rocket stands fell over during launch and a rocket shot across the infield and blew up under a car! Finally, true dark fell around 9:00 PM and Yes played the wonderful show you remember. During the battle scenes in "Gates of Delirium", the laser (electric green, dark blue) was shot into the audience in random, staccato bursts. Later, during "Soon", the laser fanned out and spun over the audience, who craned up hands over their heads to touch the light. God, that was great. One sour note, there was a bad fight down front and a guy got knifed and died. It prompted the closing of Roosevelt Stadium, so that Yes was the last concert ever played there. I remember reading that they canceled Led Zeppelin and the Grateful Dead shows the next week. My friend John had to get home by midnight, so we hopped the bus back to NYC and the bus driver was listening to the show simulcast on one of the NY FM stations. That way we got to hear Ritual. I still remember John asking: "Are they going to play that part about 'Getting over over-hanging trees . . . ?'" That was my first Yesshow, but not my last. It was one the best times I've ever had in my life and certainly will never forget. I was also at this monumental show in the old Roosevelt Stadium which, by the way, has since been torn down. My cohorts and I arrived in the afternoon on that really hot day and one thing that I remember quite clearly is that there were keyboard problems during the soundcheck. I recall Patrick and his techs trying to work out various problems during that afternoon's soundcheck and Jon coming out and saying "This is crazy" as this went on and I'm not sure if all things were fully remedied by that night. I have a tape of the show which my brother recorded off WNEW-FM while I attended and the mix was strange in places, though clear for the most part. The on-air engineers did their frantic best to keep up with the band's dynamics and the DJ's were remarking that the lasers from Jersey City were bouncing off buildings in Manhattan. One glaring mistake happened during during Heart Of The Sunrise when Patrick came in too early during the quick mid-section exchange--the tapes prove it in case anyone wants to dispute this. Chris and Alan quickly recovered the error but it stuck out pretty badly, but in all this was a great show and a very loud one as well. I got there early to watch the Possette Dart band open up at around 4:00 PM. I knew one of the members. I saw the mirror fall on the crowd, but I thought a roadie was badly hurt, it looked like it landed on his back! well we never knew what happened to roadie or the audience members who were hurt. That took nothing away from the atmosphere, the giant hot air balloon with "Tales From Topographic Oceans" on it, or the fireworks display at sunset, it was fantastic. The radio station that aired the show was WNEW FM 102.7 fm in NYC. I had a copy along time ago. I wonder if they will ever replay the show. I think our Yes friends in NY should call in and inundate them with requests, they may just replay it from their archives. Well, those are my memories from the very special night of Yes Music a long time ago. The most incredible visual experience of any concert I have attended. 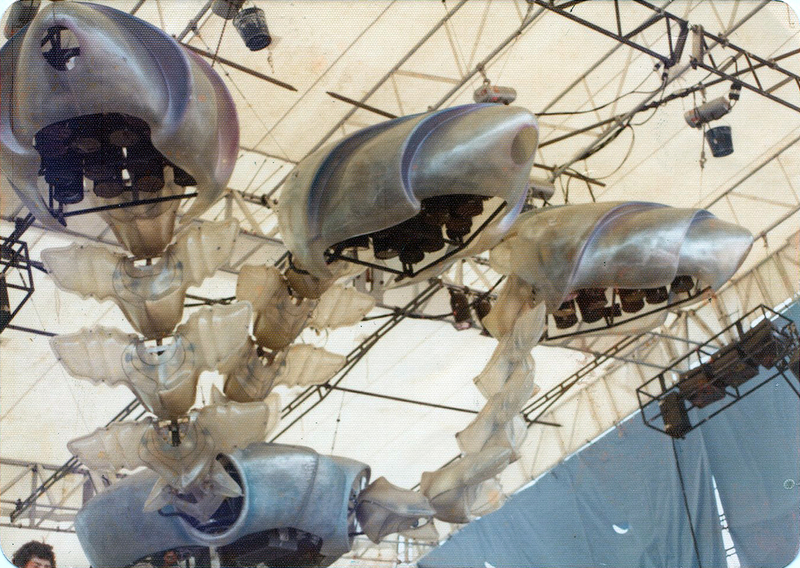 The air was thick with the jersey heat and humidity which intensified the effects of the light and lazer show.I especially remember the visual interpertation of relayer, how during the battle sequence, "the devils serman" , the outerworldy bio mechanical crabshell like spaceship,which was around 20 feet wide with 3 long cartlidge like necks with some kind of featureless heads at the ends and hovering over the drum kit, was blasting out lazerbeams all over the stadium,into the outstretched hands of all the concert goers. Then as the battle part of the song starts to wind down , we watch the life slowly leave from this dieing creature, as the lights from inside it slowly fade along with the heartbeat like sounds created at the same time by Patrick Moraz. It was an incredible sight to witness and according to the NY Daily News the next day,Those lights could be seen all the way over the bay to the twin towers in NY City. Oh YES ! by the way I do thank those Italian guys outside the stadium with the U Haul truck selling quartered watermelons. Nothing goes better with cottonmouth then watermelon. In response to Steven Sullivan's request for more information about the death that occured at the show that year... His memory is correct. A sixteen year old boy was killed outside the stadium as the show was in progress. But the murder had nothing to do with Yes or the concert itself. A group of Jersey City kids who regularily hung out in the park surrounding the stadium got into a drunken argument. One of them broke a bottle and slashed another one's throat with it. They were not fans. They did not have tickets to the show. It was a tragic, but purely circumstantial that Yes happened to be playing at the stadium on that day. At Roosevelt Stadium in 1976, the field was on its feet for the duration of "Siberian Khatru', but most settled down for some serious sight and sound appreciation after that. Anyone who was there early might remember waiting on in the rain overnight to get up close - it was general admission. Jon handed out (and tossed) fruit to the crowd during the afternoon prior to the evening's show. And let's see who's got their brain sells intack - anyone remember the giant mirror falling on the front row crowd from the stage riggin as it was being lifted in place? The bloody people being pulled up on the stage by the crew? I first saw them when I was 16, at the legendary Roosevelt Stadium show in 1976, an event from which I probably haven't fully recovered even today. Moraz is listed as playing both a solo and 'Cachaca' on the 1976 tour...I'm not sure if this is right, since 'Cachaca' was excerpted *within* the solo spot, at the show I attended. Also in 1976, Jon came out an performed the "Leaves of Green' section of 'The Ancient' for us, several hours before the show proper began. 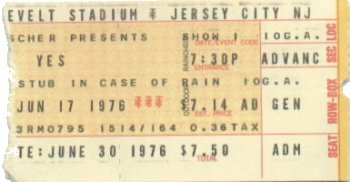 Mr. Rogoff mentions that his show [Hartford '76] occurred two nights after the Roosevelt Stadium show, which I attended. Sadly, that show too was marred by violence, although I was not aware of it myself. I heard the next day that someone had actually been killed outside the stadium, either during or after the show. Does anyone have more information on this (admittedly hazy in memory) occurrence? Btw, the only 'violence' I witnessed directly was a huge food-fight (including frisbees and assorted other objects as well) that we on the lawn engaged in to while away the hot hours preceding the show. Needless to say to those of you who've heard the broadcast, the show itself was fully 'magical. It's Roosevelt Stadium again! Woah! 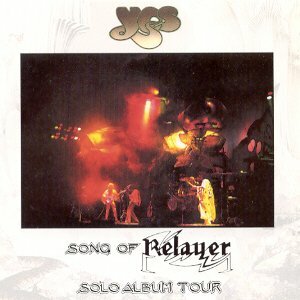 Here�s a song from �Relayer�� 'The Gates Of Delirium'. Like to take this opportunity and thank you all so very much for making a wonderful evening. Old Roosevelt Stadium! Here's a song called 'Ritual'. I think there�s a reasonable expectation that there will be an encore. I think it�s kind of in the ballpark of definite. Let me put it this way � I don�t want to be here if there�s no encore! I don�t want to be here with 30,000 of those people not getting an encore, that�s all I can say. In this particular setting, it�s the most impressive scene I have ever witnessed. I mean it�s just total bananas, pandemonium! This is great to be back in New York.